This female specimen was collected from western Australia. 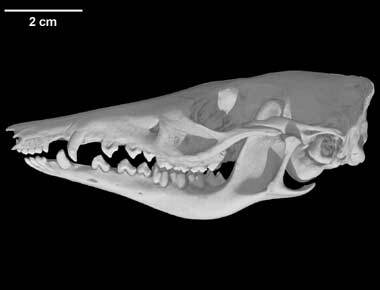 It was made available to The University of Texas High Resolution X-ray CT Facility by Dr. Ted Macrini of the American Museum of Natural History. Funding for scanning was provided by Dr. Macrini through a Dissertation Improvement Grant (DEB-0309369). Funding for image processing was provided by a National Science Foundation Digital Libraries Initiative grant to Dr. Timothy Rowe of The University of Texas at Austin. 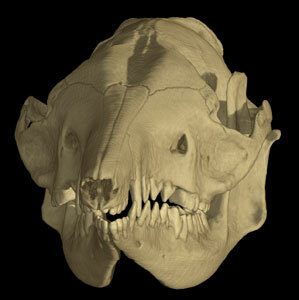 This specimen was scanned by Matthew Colbert on 5 December 2006 along the coronal axis for a total of 1038 slices. Each 1024 x 1024 pixel slice is 0.09057 mm thick with an interslice spacing of 0.09057 mm and field of reconstruction of 42.5 mm. To cite this page: Dr. Ted Macrini, 2007, "Macrotis lagotis" (On-line), Digital Morphology. Accessed April 25, 2019 at http://digimorph.org/specimens/Macrotis_lagotis/.